As your Shorkie breeder we have some very important beliefs that we hold dear and want to share with our families! First and foremost we love the LORD! He is head of our lives and we would not be anything that we are today with out him. We make no excuses for it. We live our lives in accordance with who and what he would have us to be . I may not cross every T and dot every I but I thank Him for is love and mercy and know that he is not finished with me yet! I have dyslexia and although I know it shows in the website as you read it... I embrace it and ask for your understanding and forgiveness for any typo's are errors you may encounter. I am not here to sell you a dog but rather to educate you on the Shorkie breed and for us to get to know one another. If it leads to you gettting one of our puppies that is awesome. If not then I know I did my job by educating you on the Shorkie breed and you can be prepared to ask better questions and on how to look for a good breeder. We want our loving Shorkie puppies to have a loving home and always strive to match temperaments and personalities with families as we want both the family, and the puppy, to have the perfect home. We have often be referred to as the expert in matching puppies and people. For that very reason we hope you don’t mind us getting upfront and personal with you so we can really get to know all about you and your family. 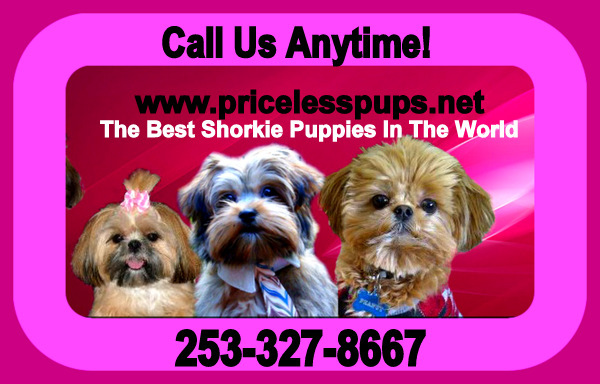 It is important so we can match you with the right Shorkie puppy or even perhaps tell you that we do not think the Shorkie is the right breed for you. Please also know we expect the same of you! It is so important that IN THIS DAY AND AGE YOU TRUST MORE THAT YOUR GUT INSTINCTS ABOUT A BREEDER! Great breeder (me) Great Vets (them) and great puppy parents (you). It is WIN WIN all the way around but especially for the puppy.